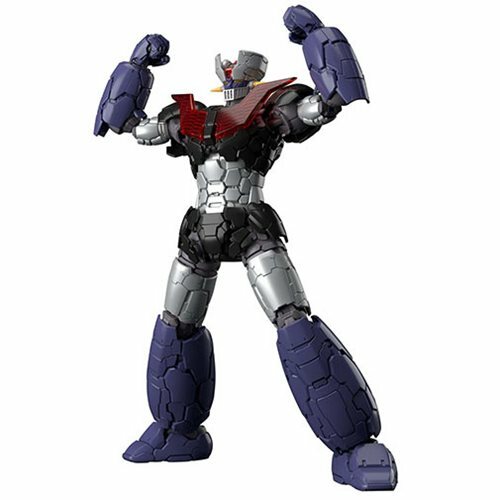 From the hit Mazinger Z Infinity movie comes this Mazinger Z Infinity Mazinger Z HG 1:144 Scale Model Kit. The proportions seen in the movie and its iconic details have been fully recreated under the supervision of mecha designer, Takayuki Tanase. Intricate and realistic detailing in the backs of the clear parts have been processed, adding even the smallest of details with the utmost care. An abundance of optional parts allows for a faithful recreation of scenes from the movie! The Mazinger Z Infinity Mazinger Z HG 1:144 Scale Model Kit includes 1x Jet Scrander, 1x Iron Cutter Parts, 4x hand parts (right spear hand, right handshake hand, left & right clenched fists), 4x Designated Drill Missile parts (separating Rocket Punch left & right, Drill Missiles left & right), and display base. Also includes 13x Runners, 1x Sticker sheet, and Instruction manual. Measures about 6 9/10-inches tall.